Before traveling to Iceland I had heard that the food and drinks were both quite expensive. One thing to keep in mind though is that they don’t expect you to tip so it is not too bad. One reason the craft beers are more expensive is the alcohol tax that is higher on higher alcohol beers. So the double ipa and imperial stout are served in 200 ml pours at most places. I visited all 3 bars on my list inside Reykjavik. Mikkeller was the most expensive as to be expected. Sometimes it was 1400ikr for a 200ml pour or about $12. Mikkeller does not serve local beers but Norwegian beers and other imports. The selection is nice and at least given the price they are used to giving you a splash to taste a few before buying. Ironically I ended up ordering a beer from the US because they had recently finished a tap takeover featuring breweries from the Midwest. West Coast style IPA from Gaedingur. Really good example of the style. 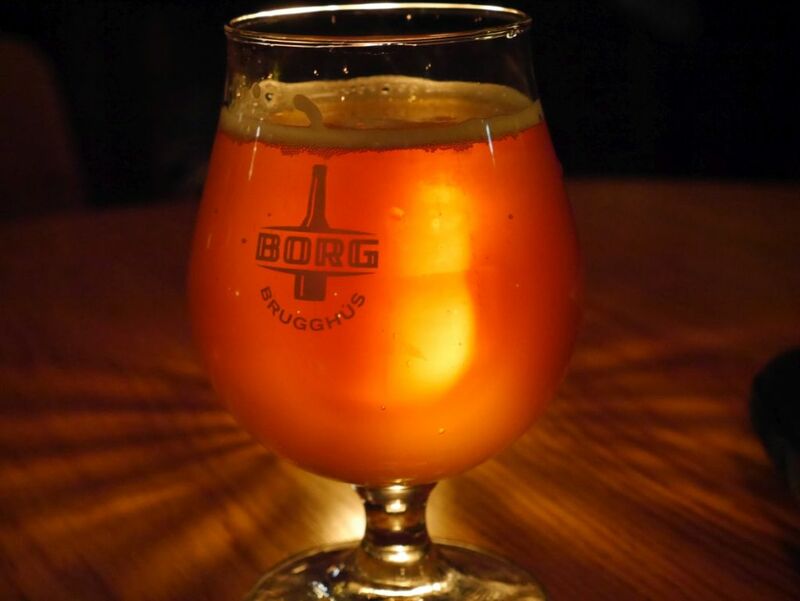 Just down the street is Skúli craft bar, another local bar, this one primarily serving beers from Borg but also offering other guest taps as well. When I visited there my husband and I together had a delicious imperial stout (brewed by Borg), milk stout (from Mikkeller), and saison (also from Borg). The saison was nice and crisp herbal and fruity with thyme added. It had a light honey flavor on the back. This reminded me of some of my favorite saisons brewed in the United States and really hit the spot. 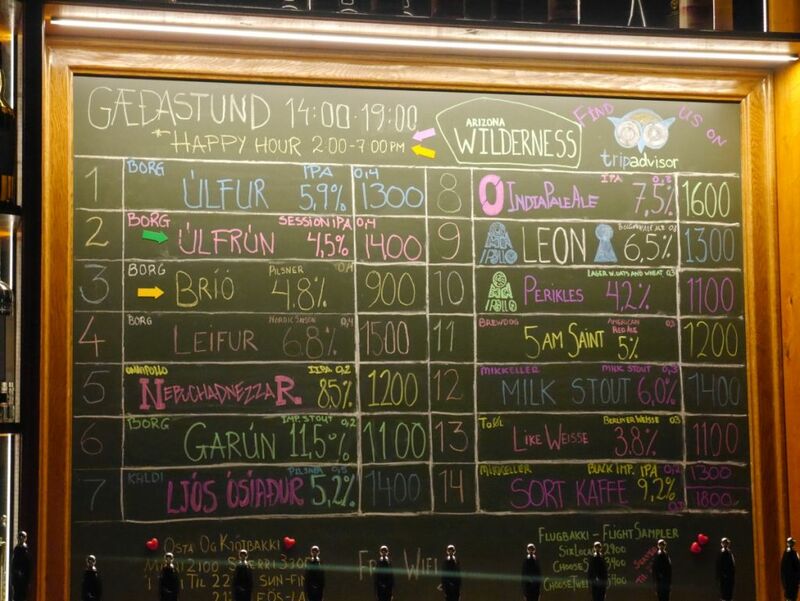 Prices here made me appreciate the prices at Mikkeller in Bangkok. Needless to say I didn’t drink a ton of beer while I was there because of the prices. Look for this awesome sign outside when trying to find Skuli. 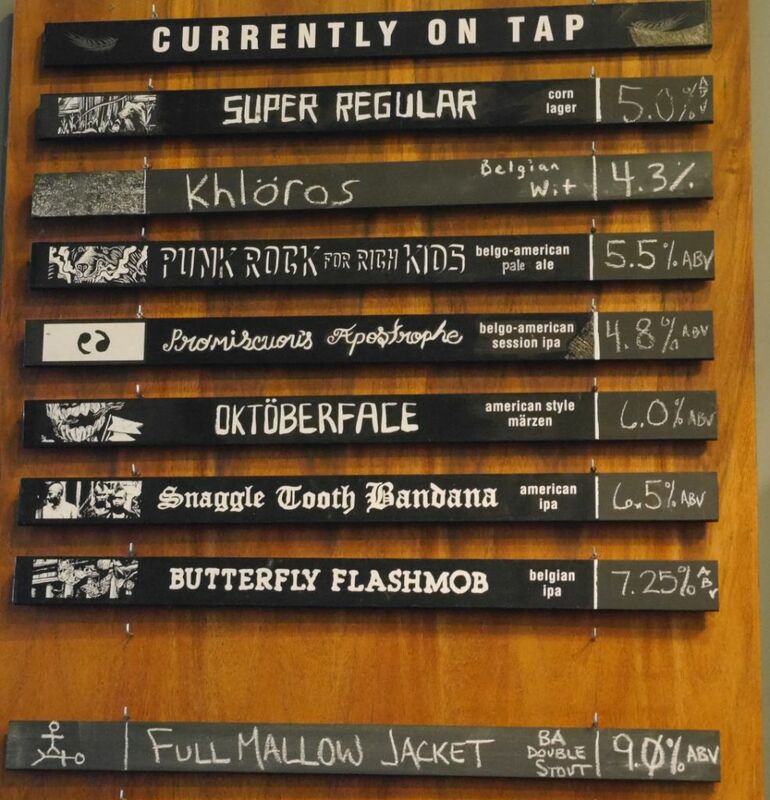 Tap list from when I visited Skuli Craft Bar. The delicious saison I had on tap. I would absolutely suggest anyone who visits Reykjavik go to both Microbar and Skúli craft depending on the style you like. They are both very close to each other. Google knows where Microbar is but gets the location of Skúli a bit wrong. 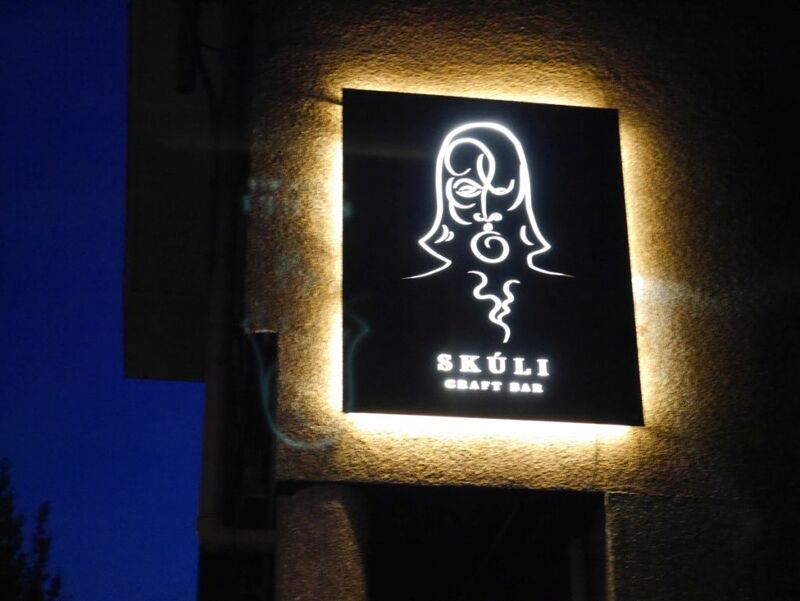 The best way to get to Skúli from Microbar is to go out the south entrance and turn right, then look to your left for the Skúli sign. Visiting these bars is also the best way for someone to try some beers from the smaller breweries without leaving Reykjavik. 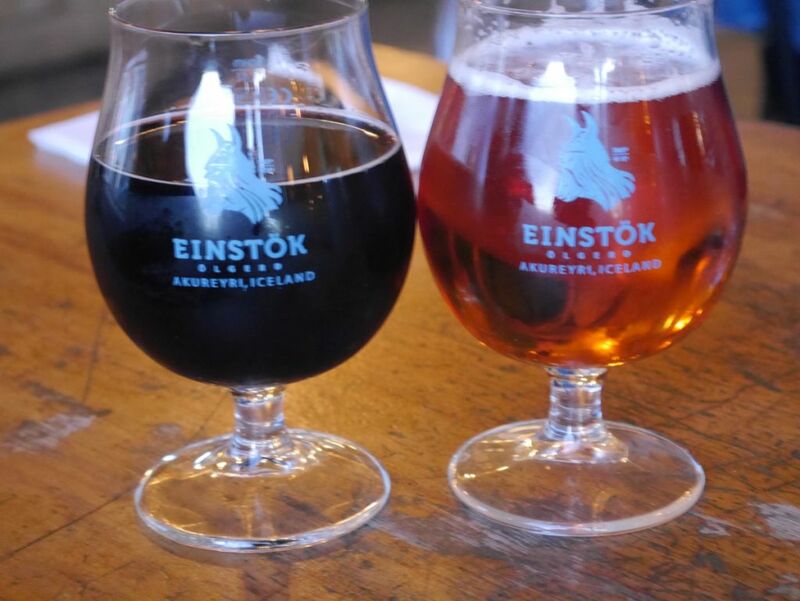 Elsewhere you will find plenty of mass produced lagers and occasionally beers from Einstok, one of the larger Icelandic craft breweries, including their toasted porter, white ale, and pale ale. Ironically it is probably cheaper to buy Einstok beers in the stores in the US but it is still nice to order a few while in Iceland. The pale ale was nice and lightly bitter, featuring plenty of English style hops. Einstok beers we ordered at a local cafe. Only the pale was on tap. Border X originally opened in Otay Mesa, very close to the border with Mexico. 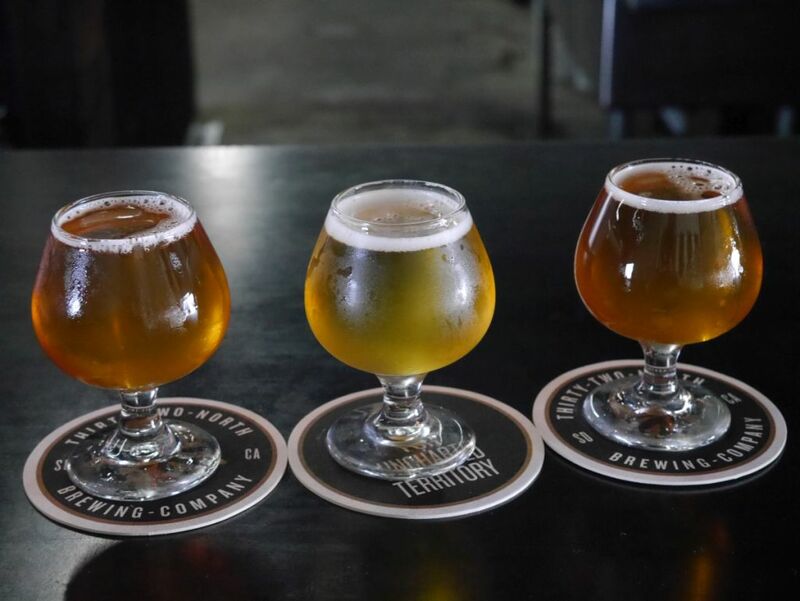 The beers are still brewed at that location but more recently they opened a satellite tasting room in Barrio Logan, closer to Downtown San Diego. I visited the Barrio Logan location recently to try their beers. 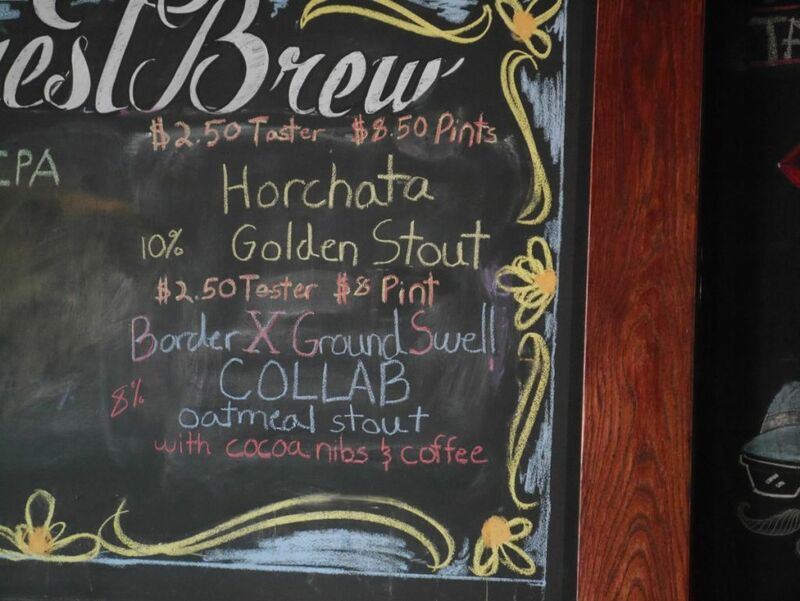 I didn’t get to taste the popular Blood Saison because they ran out but I did get to taste the Hefeweisen, Abuelos pale ale, Abuelita’s chocolate stout, Horchata golden stout, and a coffee oatmeal stout they brewed in collaboration with Groundswell Brewing. The hefeweisen was a nice cloudy yellow with a light citrus kick that blended nicely with banana and pineapple. Though it was largely to style, their version was a nice change to the typical, and very refreshing. 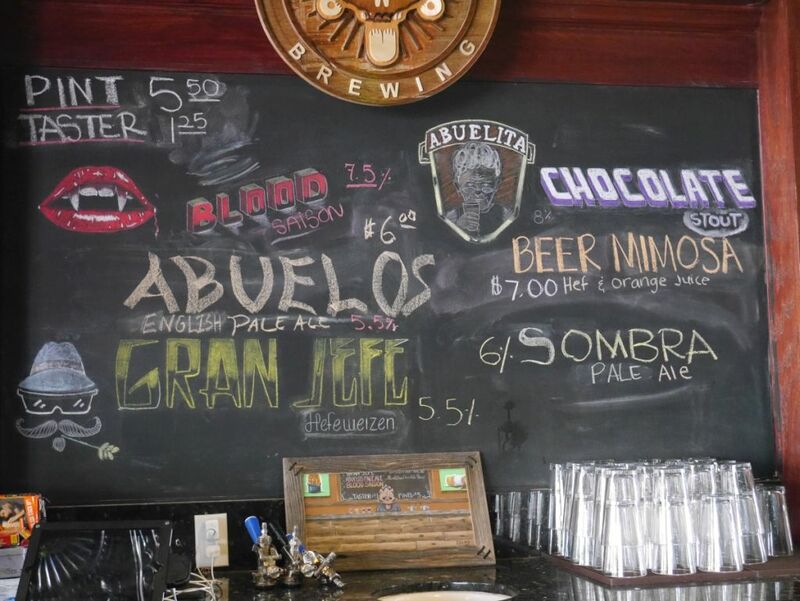 The Abuelos pale ale was a solid fruity English style pale with figs added. The beer was lightly bitter and very smooth. This was the only hoppy beer available when I visited, so it might not be the best destination for hop heads looking for West Coast style brews. The Abuelita’s chocolate stout had a deliciously smooth oatmeal stout body and bright chocolate flavors on the front. I found it less bitter than most stouts. The beer has a light vanilla on the back. The chocolate flavors were also very different than you see in most local brews because it uses the Mexican style of chocolate usually used in the chocolate drinks available in Tijuana and elsewhere. It reminded me of some of the better of such drinks I have experienced in Tijuana. This is certainly a standout beer that they brew. The Horchata golden stout isn’t boozy at all despite being 10%. It could easily be confused with ordinary horchata. The beer was very smooth and sweet with the right amount of rice, vanilla, and cinnamon. The brewers create an extract of the vanilla and cinnamon themselves that gives it authentic and not fake-tasting flavors. The coffee oatmeal stout brewed with groundswell was a nice smooth oatmeal stout with light coffee in the back. It was very nicely balanced, though I slightly prefer the chocolate stout. 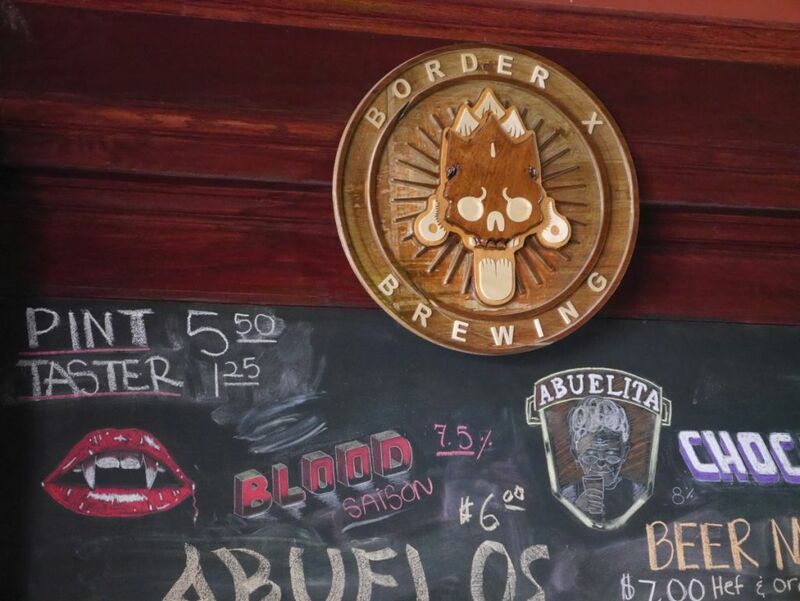 Though Border X isn’t a place to visit for hoppy beers because they didn’t have an IPA they are brewing some awesome stouts and word on the streets is the Blood Saison is also really good. Both the chocolate and horchata stouts were very impressive. I hope to visit them in the future to see how things are going. The tasting room in Barrio Logan has a similar feel to places I have visited in Tijuana with plenty of Mexican imagery on the walls. At the beginning of my recent trip I spent a few days in Washington DC. There was one brewery I could visit within the city itself but it was so out of the way without a car I skipped it (The brewery is called DC Brau). 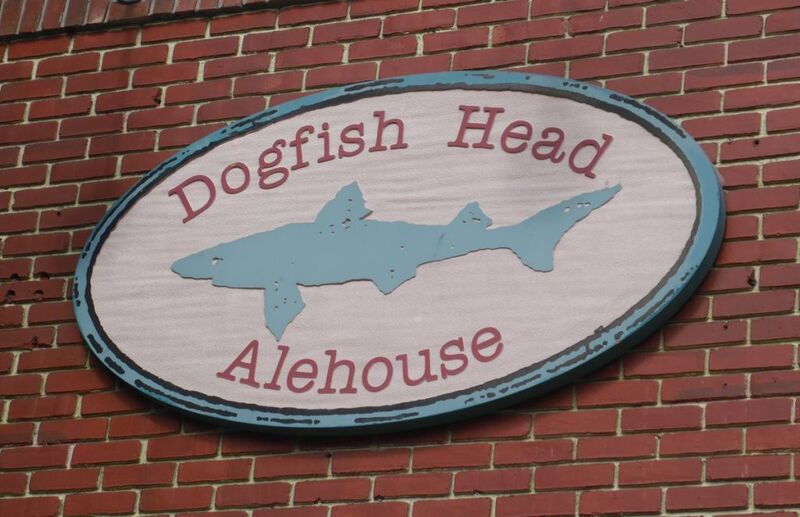 I was beginning to think I wouldn’t visit any breweries and then I realized that dogfish head has a few different brewpubs within a quick train ride from the city. I visited the closest Virginia pub and ordered a flight followed by some other specialty beers. Because I visited a brewpub I is not surprising that they only had one flight to choose from and a very expensive specialty flight option. I stuck with the core beer flight. This meant I got to taste the wheat, 60 minute ipa, 90 minute ipa, Indian brown, raisin d’etre, and pumpkin ale. My husband also ordered a goblet of the chicory stout because it was not included in the flight. I also tasted the choc lobster in a pricy $10 goblet. The wheat was well done and to style offering plenty of added spices and Belgian yeast. The 60 minute was a light color and light body ipa with a mild citrus kick and some resinous hops that finished nicely with a light bitterness. It was miles different fresh from the source than anything I’ve had in a bottle. The chicory stout was nicely balanced with a light smoke and light coffee flavors that blend nicely with some bitter chocolate. It is surprisingly light body and almost looks like a brown ale. This was a beer I didn’t expect to enjoy from the description but really liked. My husband was satisfied as well. The 90 minute was very fresh and surprisingly different even from the somewhat fresh bottles I had bought in DC. 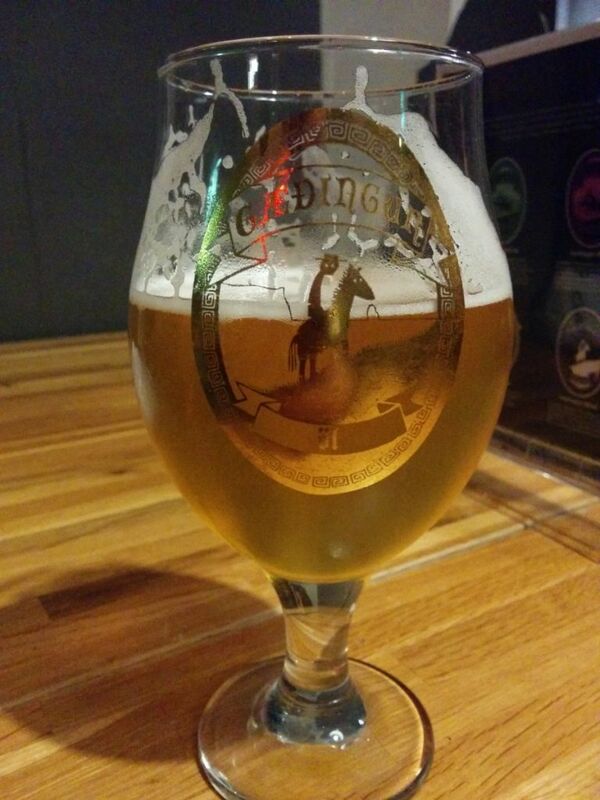 It is a combination of resinous hops and a syrupy honey like thick body that finishes with a boozy after taste. If I didn’t have two more bottles of the 90 minute in my hotel room I would have ordered a pint fresh right there. The Indian brown had a nice sweet caramel back from brown sugar added with roasted malts and heavy hop bitterness. This was great most bitter of the bunch. The raisin d’etre is a strong dark Belgian made with beet sugar and green raisins added. The raisins left a strong after taste that lingers heavily and I did not particularly enjoy. My husband finished the taster and liked it surprisingly. The pumpkin ale was mostly a light ale with a ton of spice added. It was easy to drink but didn’t have any particular quality to recommend it. I tend to prefer pumpkin ales with higher alcohol so they have more sweetness to balance the spice. Finally the choc lobster sounded like a good idea when they described it but neither of us was particularly impressed. 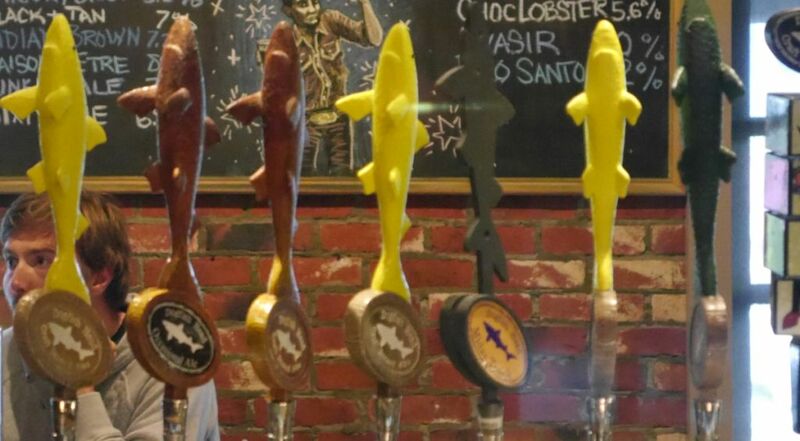 It is a beer made with chocolate, basil, and lobster added. The basil and chocolate together gave it a cinnamon taste and it ends with a light salty taste. I much prefer the chicory stout to this. Though it improved somewhat when it warmed up it didn’t have the complex flavors I would expect for such an expensive beer. If all you ever had from dogfish head was in a bottle on the west coast you should absolutely check out the brewery if you are in the area. I enjoyed the IPAs so much that if I find them fresh in town I will probably buy some more. 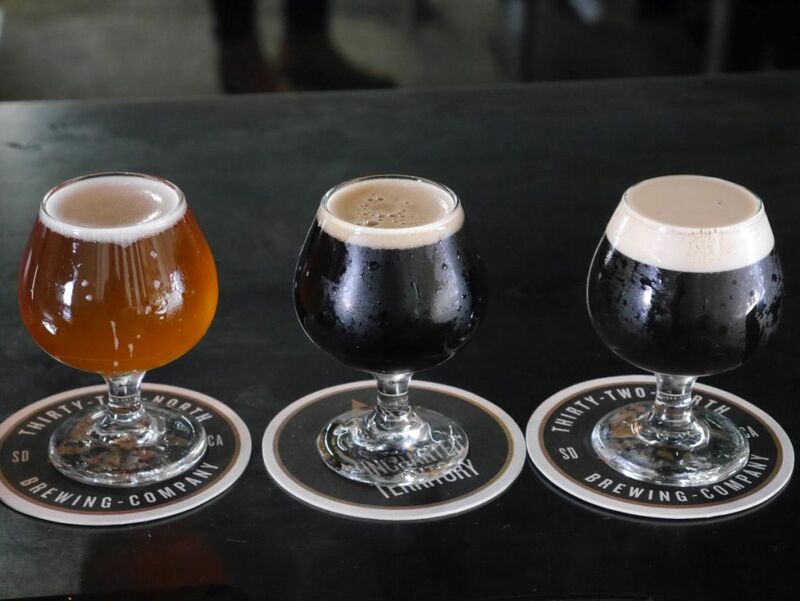 Solemn Oath showed up on the list of breweries to visit outside Chicago proper when I was looking for a place to go and I always prefer tasting rooms whenever possible. 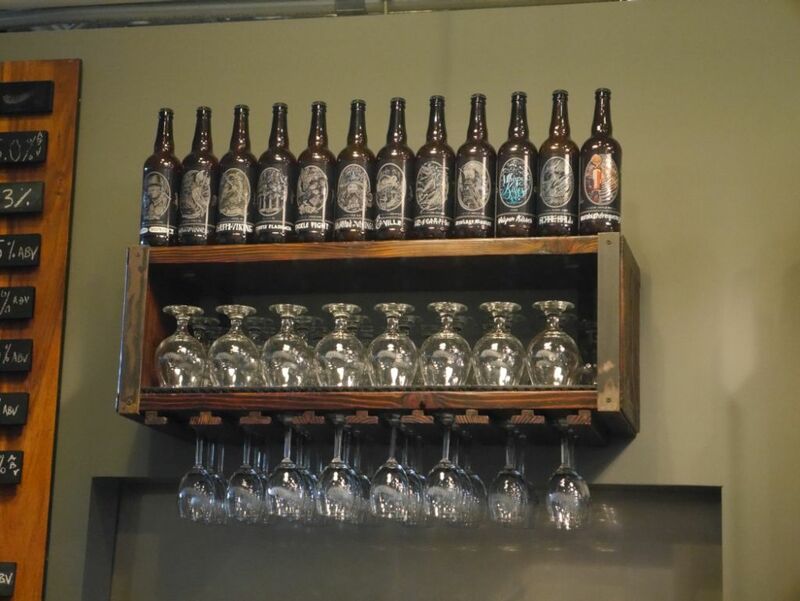 Thankfully one of my hotels during the trip was close to Solemn Oath so it was easy to drop in for a few tasters. 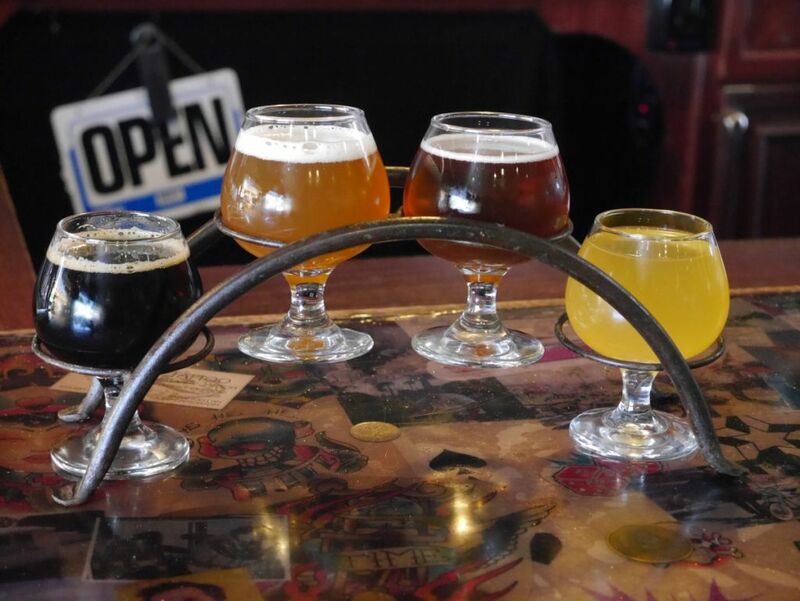 This visit was after going to Penrose brewing earlier that day, and the only things that interested me on the menu were the IPAs, the Oktoberfest and barrel aged stout. I got tasters of the Belgian IPA, IPA, Oktoberfest, and bourbon barrel aged stout. I started with the Oktoberfest and was surprised by the massive amount of hop bitterness. Typically this style is made with zero hops so the existence of hops at all is a huge departure from the style. This would have been fine if the hops balanced with the rest of the beer but they stood out and gave the whole beer a powerfully bitter taste and a strong bitter after-taste. The IPA had a lot of grapefruit flavor from the hops and overall seemed to be solidly balanced. Though it was also quite bitter, the hop flavors didn’t clash as much with the malts. 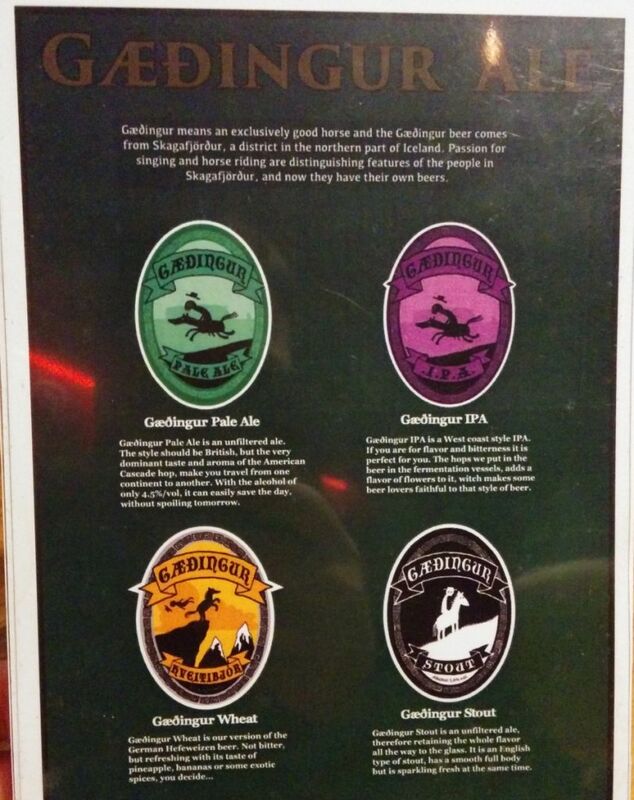 It seemed like the same hops were used between all 3 (oktoberfest, IPA, and Belgian IPA). The Belgian IPA was also quite bitter and any spice from the Belgian yeast was overpowered by the same grapefruit hops and powerful bitterness. In all 3 of these brews it seemed the focus was on bitterness over aroma and they missed some areas where they could have really shined. I ended with the bourbon barrel aged stout. This was an instant hit among my friend and my husband who both love dark beers. From what I got to taste of that one it had a nice full body and some solid sweetness along with the bourbon flavor but to me it seemed a little too sweet overall and not dry enough. Still, it was more impressive than the other before it. Before I left I did get to taste some of the lighter offerings from the brewery thanks to some people near me who let me taste the pale ale. The lighter offerings seemed to be much more balanced than anything I tasted, so perhaps the brewer was experimenting with a certain variety of hops that wasn’t planned to result in so much bitterness. Those same people mentioned that Solemn Oath makes new beers regularly so the specific beers I tasted when I dropped by may not be the same ones you find if you come to visit. 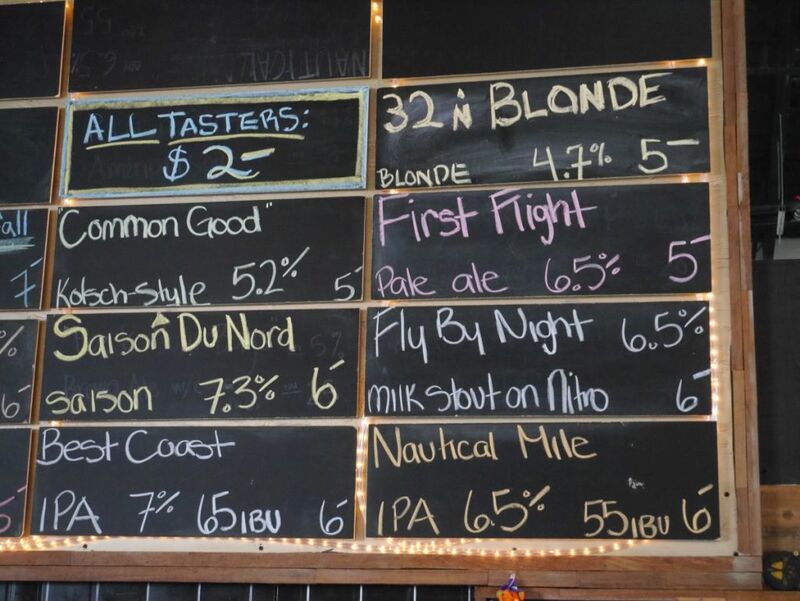 32 North had a solid opening almost a year ago, with a great-looking tasting room and a good lineup of beers. Six months later, or soon after, their brewer quit, leaving them to scramble and basically start over. 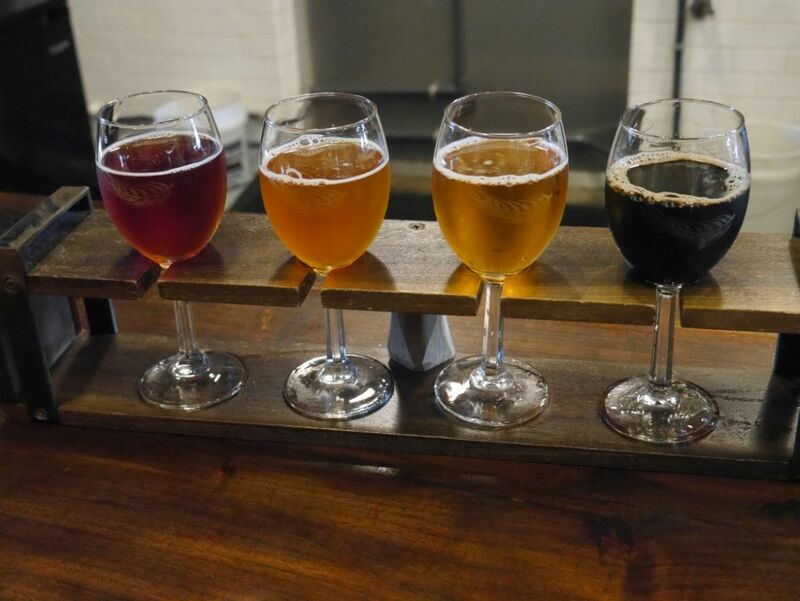 I visited them on October 15th, to see how things have developed, giving them a few months to get new brews ready with their new brewer and I am happy to report that they are back to the solid lineup they had going for them when they first opened. You can find my original post on them here. Some areas still need a little work but I am confident they will find a way to succeed going forward. I am writing this as if they were a completely new brewery because I expected that many of the beers I covered at the start would change drastically, and they did. First set of tasters. Saison in the middle. 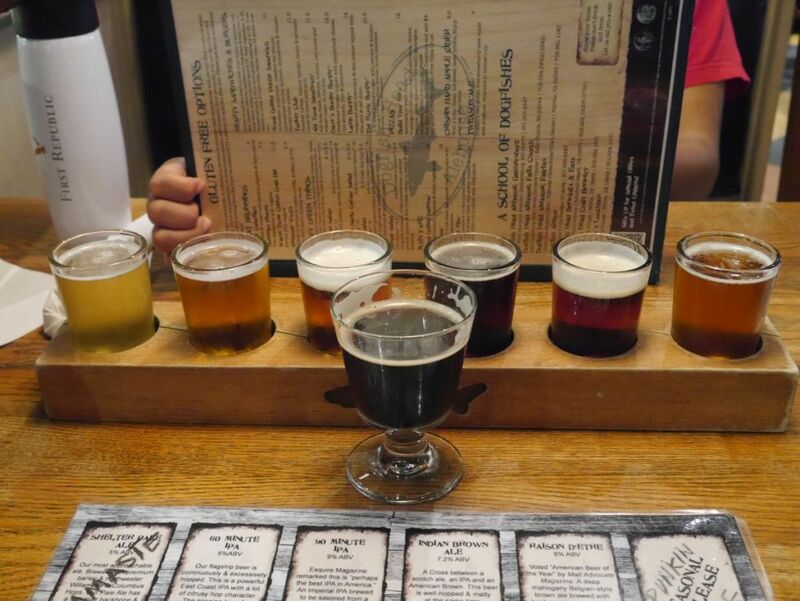 When I visited I tried the First Flight pale, Saison du Nord, Nautical Mile IPA, Pack Your Bags brown ale with cocoa nibs, Fly By Night milk stout on nitro, and Best Coast IPA. They also had a blonde, kolsch, and gose on tap and another pale ale. I went for the beers that I remembered as being the best previously as well as those that sounded the most interesting. My tasters were split into two flights and will be discussed in that order. I started with the First Flight pale ale. It was mostly citrus with a mild spicy kick. Though it didn’t have any added peppers but it reminds me of beers with peppers. The beer has a nice golden color but I can’t help but feel the spicy kick kinda overpowers the rest, not a flavor that I expect from the hops. It was not too bitter and ends nicely with a floral hop kick. The beer was solid and drinkable but hopefully future versions will present the hops better. The Saison du Nord was a lightly fruity saison but nice and dry. It doesn’t have too much spice or pepper but enough to balance it out. A very impressive saison. It reminds me of the Collette from Great Divide. The Nautical Mile IPA was a little bit stronger than the First Flight pale and still has that pepper kick but it is much milder and the flavor has more grapefruit up front. The beer has a beautiful orange color, and is quite smooth. No longer the tropical fruit flavor of the original. It is a solid IPA but the hop flavors are a bit different than I usually get from them. It has a medium bitterness on the back end. Like the First Flight this is solid but it feels like it could be better in future versions. The Pack Your Bags brown ale with cocoa nibs was a very smooth brown ale with a mild bitter chocolate finish and a light body. Though I say bitter chocolate, this is not a bitter beer, but it isn’t a sweet beer either. This is closer to the Benchmark brewing style of brown than nut browns you see around town. The Fly By Night milk stout on nitro is no longer made with coffee. This is a super roasty stout with a mild sweetness from the lactose. Despite a 6.5% alcohol it is quite light body and nice caramel finish. It also has a bit of a roasted popcorn flavor on the end. The Best Coast IPA seems to be the least hoppy of the bunch despite claiming to be the highest IBU of them all. Hops are very subdued and a bready malt seems to take over. Hops are very earthy and balance with the malts. The beer has a dark orange color. It is very different from the typical local but probably my favorite among the bunch of hoppy beers. The balance is its best positive. 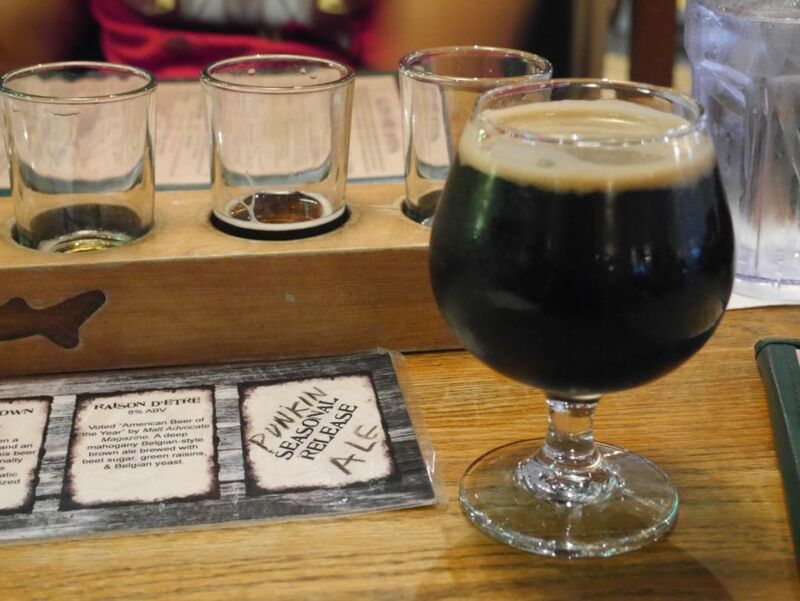 The other thing they had at the opening that was quite popular was the peanut butter porter, which they will be bringing back for their one year anniversary coming up in a week (On October 22). Though it took them a while to get back to the promising start they had originally, I am now quite excited to see how they do in the coming year. 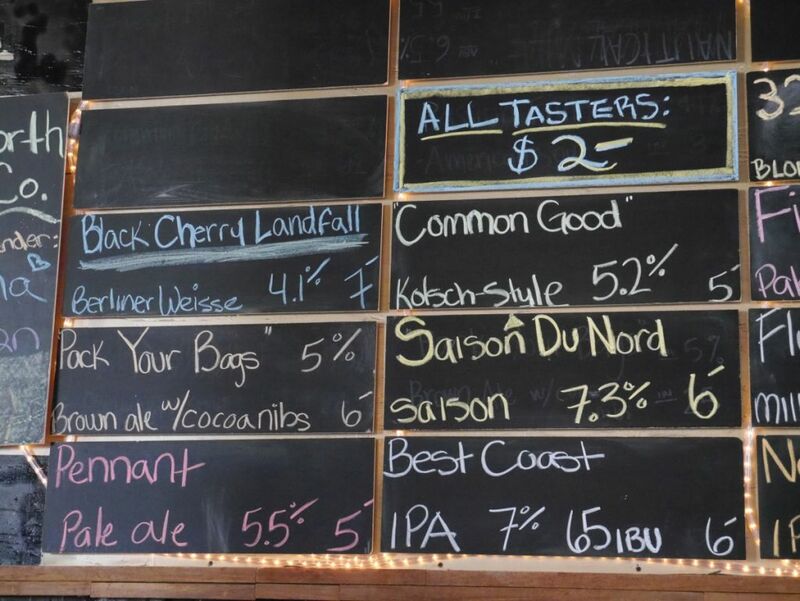 I purposefully avoided the black cherry landfall because I have had enough of the gose in my previous visit but I will certainly keep an eye on the various options they have going forward.